You are here: Abbey Labels Ltd > News > George Completes the 2017 London Marathon – raising £3,055 for Charity! George Completes the 2017 London Marathon – raising £3,055 for Charity! Huge congratulations to Abbey Label’s George Welham, who successfully completed his first London Marathon in 4 hours and 38 minutes. 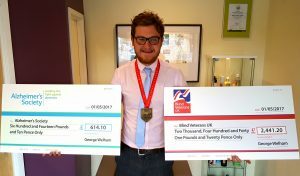 Inspirational George Welham has raised over £3,055.30 for the Alzheimer’s Society and Blind Veterans UK. George’s lifetime achievement has inspired many of his co-workers to follow his lead and this year 10 members of the Abbey Labels team have applied to run in the 2018 London Marathon.